Friday, January 25 was a special day in the annals of media events in Nigeria. 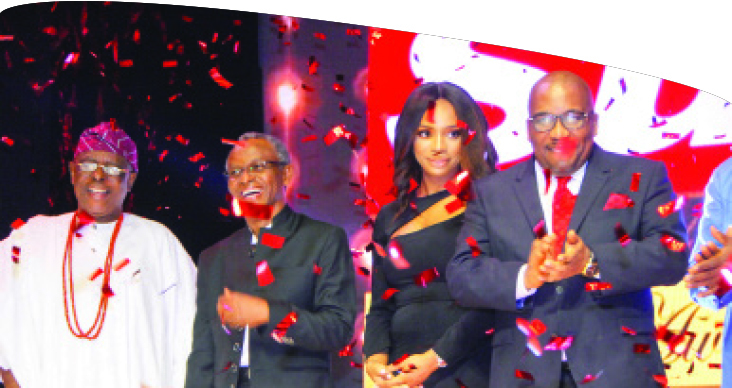 It was a day The Sun Publishing Limited held its 16th edition of the annual The Sun Awards. The ceremony, which has unarguably become the biggest media event in Africa, honoured 22 outstanding Nigerians, for remarkably distinguishing themselves in their various fields of endeavours. One week after the event, its echoes still resonate as millions of Nigerians within and outside the country, who followed the live broadcast on three national television stations – Channels Television, African Independent Television (AIT) and Nigerian Television Authority (NTA) – keep talking about it. On that special day, the Convention Centre of the Eko Hotels and Suites, Victoria Island, Lagos, which was the venue of the prestigious award, was filled to the brim, with guests from all walks of life. It was the gathering of the crème de la crème of Nigerian society. Governors, state and federal legislators, politicians across parties, captains of industry, business moguls, and academics, among others, were in attendance. Guests, who were elegantly dressed in various attires and looking splendid, were carefully ushered into the elaborate hall. Radiating beauty, panache, fun and elegance, they were skillfully arranged around tables exquisitely draped with alluring white and red wraps of cloths, with each table alluringly tempting and inviting. The illumination that intermittently filled the stage marvelled all. It was indeed a night of glitz and glamour. Those who have been keenly following the annual awards said the choice of the magnificent hall suggests the size and stature of the event, which they acknowledged has continued to be improved upon with every passing edition. The crowd was huge. Setting the tone of the event was the Managing Director/ Editor-in-Chief of The Sun Publishing Limited, Mr. Eric Osagie, who said the main essence of the event was to always prove the point that Nigeria is a great country. He said though tongues and tribes as well as political parties may differ, but in brotherhood the country has been able to weather the storm. Maintaining that the awards remain the biggest media event in Nigeria and Africa, Osagie noted that like a mustard seed, it has continued to grow 16 years after its debut. He commended the efforts of his predecessors, Mr. Mike Awoyinfa, Mr. Tony Onyima and Mr. Femi Adesina at nurturing the award to become what it is today and promised that he would continue to keep the flame burning. In his remarks, the Publisher of The Sun Newspaper and former governor of Abia State, Dr. Orji Uzor Kalu, noted that the destiny of Nigeria rests squarely on Nigerians, expressing optimism that Nigeria would be great if things are done the right way. “The destiny of this country lies in the hands of Nigerians. We are the ones who will make this country to be better reckoned with within the comity of nations. Non-Nigerians, no matter how they claim to love Nigeria, will not be the driving force of our country; we are the ones to make it happen. It is the good things we do as individuals that will aggregate and cause the transformation in our country,” he noted. Represented by his daughter, Mrs. Neya Iyere, Kalu sent his well wishes to everybody that attended the occasion, as he commended the awardees, who he acknowledged must have done something remarkable to be singled out for the award out of over 180 million Nigerians. “They should be proud of their accomplishments just as The Sun, which has honoured them today, is proud of what they have done to win this auspicious recognition. When I look at what these award winners have achieved as well as tremendous achievements of other Nigerians in socio-economic and political development of the world, within and outside Nigeria, my conviction that we have people who will change the trajectory for the best is strengthened,” he said. The night was not only restricted to handing out awards and honours to those who deserved them. There was equally a lot of fun. One of Africa’s finest female musicians, Tiwa Savage, electrified the hall. Dishing out scintillating tunes that kept the audience cheering, the musician left the audience shaking to her tunes even as they sat. Tiwa’s seductively-clad dancers did justice to every rhythm. With indescribable energy, speed and accuracy, the dancers dazzled all. Before the show started proper, the evergreen Veentage Band was in its best elements. The live band crew sang their hearts out. The band was at home with both contemporary and the old school songs. Singing soul-lifting songs from the repertoire of local and foreign collections, and with uncommon passion and exactness, the band members set the award winners and guests in the right mood, making it an evening of fun and excitement. The event kicked off proper at 7:30pm with the master of ceremony (MC), a popular on-air personality, Mr. Ikponmwosa Osakioduwa, quickly warning that any form of political campaign or promotion of political parties was not allowed. He reminded all that the event was dedicated to extraordinary Nigerians across political, religious and ethnic divides, who had made extraordinary marks in 2018. The entrance of the entourage of the Governor of Enugu State, Ifeanyi Ugwuanyi, who emerged the Governor of the Year, created a stir. The governor was ushered into the arena by dozens of women and traditional dance groups that sang in Igbo language and danced to welcome their own in whom they are well pleased. The shout of “Gburugburu” rent the air. One of the most sought-after comedians in the country, Abovi Ugboma, popularly known as Bovi, was on top of his game at the event. For the few minutes he was allotted, he thrilled the guests with rib-cracking jokes. His wisecracks, focusing on trending issues, such as political campaign posters across Nigeria spontaneously caught the awardees laughing. The Sun Awards 2018 celebrated Governor Nasir El-Rufai of Kaduna State and Ifeanyi Ugwuanyi of Enugu State as Man of the Year and Governor of the Year respectively. Other state governors honoured were the governors of Borno State, Kashim Shettima, who won the Courage in Leadership Award and Seriake Dickson of Bayelsa State, who clinched the Outstanding Politician of the Year award. In his remarks, Governor El-Rufai commended The Sun Publishing Limited for choosing him as Man of the Year, and admitted that the number of guests around had overwhelmed him. Praising The Sun for the highly cherished award, he said it was difficult for people like him to earn such recognition, owing to his no-nonsense and uncompromising stance against illegality and waste in governance. He said The Sun remains unbiased in selecting its winners. Also in his remarks, Governor Ugwuanyi, who quickly reminded all that Enugu State was in the hands of God, thanked The Sun management for the award. He prayed that The Sun would continue to grow from strength to strength. “Enugu is in the hands of God. I appreciate The Sun for this award and I pray that the company will grow from strength to strength,” Ugwuanyi submitted. The Lifetime Achievement Award was won by the trio of music maestro, King Sunny Ade (KSA), former governor of Ogun State, Chief Olusegun Osoba and Senator Florence Ita-Giwa. Legal icon, Chief Afe Babalola (SAN) went home with Education Entrepreneur Award. In his acceptance speech, Chief Osoba dedicated the award to all the reporters who are still active in reporting, saying he still remains a reporter and would die a reporter. He thanked The Sun for the award. In her response, Senator Ita-Giwa expressed gratitude to The Sun for giving her the award in her life time, saying she preferred lifetime award to posthumous award. The former senator said her election into the Senate has helped her to do a lot for her people, particularly the resettlement of Bakassi people. She promised to continue fighting for the good of her people. Other awardees included the wife of Rivers State governor, Justice Suzzete Nyesom-Wike, who won the Most Supportive First Lady of the Year; Chief Leemon Ikpea, who clinched the Business Person of the Year; Mr. Nnamdi Okonkwo, who won Banker of the Year and Sir Daniel Chukwudozie of Dozzy Group Limited, who went home with the Manufacturer of the Year award. The Humanitarian Service award was won by Emperor Chris Baywood Ibe and the richest black woman in Africa, Mrs. Folorunso Alakija. In her acceptance speech, Mrs. Alakija gave thanks to God for her ability to reach out and touch the less privileged through the Rose of Sharon Foundation. “I will like to dedicate this award to every widow who has had to shed tears; and to every orphan who has ever had to cry, whether in Nigeria, Africa or any part of the world. God bless you all, thank you,” she said. Also thanking The Sun, Emperor Ibe described the award as the ultimate award, and said Baywood Foundation had touched the lives of over 100,000 people. He said the foundation was solely funded by himself and his wife as their way of giving back to society. “So, we praise God for the milk of kindness that he has extended to us. For that guy who lost his life, Joe Blackson, Baywood Foundation will support his young son with N1 million,” he promised. The Heroes Awards, won by Joe Blackson and Mallam Abubakar Abdulkadir was the highpoint of the occasion. It was a time when many betrayed emotion and shed tears for the family of Joe Blackson, who died that others might live. The audience wore mournful look as The Sun MD, Mr. Osagie, recalled how the young Blackson put his life on the line so that others might live. Blackson, he said, rescued 13 people, who were drowning after their boat capsized. In an attempt to rescue the 14th, he drowned from exhaustion. For this sacrifice, he won the hero award. There was a resounding clap and standing ovation as his wife, Mrs. Mercy Blackson and the two young children he left behind, were called to the podium for his posthumous award. The Blacksons got N250, 000 from The Sun Management, as the award goes with a cash reward. However, it was not only The Sun that donated money to the dead hero’s family. There was, indeed, naira rain. At the end, the family got some millions of Naira pledged by kind-hearted Nigerians. Also, for hiding about 300 Christians in his mosque and thereby saving them from being killed by herdsmen in Plateau State, a Muslim cleric, Malam Abubakar Abdulkadir, was also recognised as a hero. He also smiled home with The Sun’s N250,000 and another N1million donated by the Kaduna State Government. Visibly delighted at The Sun’s magnanimity, Mallam Abdulkadir pledged to continue to serve humanity. In the public service award category, the Niger Delta Development Commission (NDDC) former Managing Director, Mr. Nsima Ekere, and the Registrar of the Joint Admissions and Matriculation Board (JAMB), Professor Ishaq Oloyede, emerged winners. Sports Personality of the Year award went to world heavyweight boxing champion, Anthony Joshua and top striker in the national female team, Asisat Oshoala, while two entertainment superstars, Genevieve Nnaji and David Adeleke, aka, Davido, emerged Nollywood and Creative Personalities of the Year award winners respectively. With the fun and excitement of the 2018 The Sun Awards, the memory will linger to next year when another ceremony will be held.